Musicians: John Paul Gandy, Miriam Lowbury/Zoe Martlew, Peter Furniss, Julian Warburton. Synopsis: "Meet the Fitzroys: Mum, Dad and the two kids - a family with secrets that are about to explode. Mrs F is thinking about past romance and the father of her son, Mr F’s furious, Leo’s in love, Flora’s piecing together her parentage and an old family friend turns up with an eye to the main chance and the answers to some questions no-one dares ask." This was the most inspiriting collaborative exercise seen in years, and especially as an economical, commercially viable contrast to the extravagances of Covent Garden's newest commission, Ades' The Tempest during the same week. Tête à Tête is an ever-innovative company which takes risks; their Orlando plays mad is affectionately remembered from the Battersea Arts Centre. 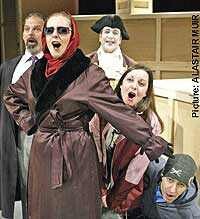 For their 2004 production and tour, six youthful composers shared Amanda Holden's libretto based imaginatively upon The Guilty Mother, the little known final play in Beaumarchais's Figaro trilogy, in which the Almavivas come down in the world, their guilty secrets come out, and the self-serving schemes of the villainous 'best friend' are thwarted in the nick of time. Between the two performances we saw, I acquired the English version of the Beaumarchais original, and am vastly impressed by the skill with which Amanda Holden adapted it for opera; worthy of Mozart's librettists. There were public workshops last autumn and the story, transposed to present-day, raised concerns about family secrecy, betrayal, legitimacy, identity etc with 'voluminous feedback and buzzing conversations'.Each composer retained his/her own idiom but 'had to immerse themselves in each others' work so as to be able to understand their own place in the piece as a whole'. Their disjunctive idioms meld smoothly and the contrasts do not jar. Family Matters is a bold operatic experiment, with numerous resonances to drama and opera over the ages, and taken on its own terms, it is a triumphant success. I haven't enjoyed 'a night at the opera' more for years, and seen a second time took in more and with heightened admiration for an achievement which has received rather patronising responses elsewhere! The staging is portable and clever, many of the scenes coming out of a box which is helpfully labelled with the composer's name. The six composers, from very different musical worlds, have a scene each sequentially in the first half and two each in the second half. The story line is absorbing and the built in changes of musical idiom worried us not a jot. Although the music is readily accessible, it is rarely simplistic and the show is definitely closer to opera than the 'musical', and it is another triumph for The Bridewell. The musicians are placed around the action, and the scoring for keyboard, cello, clarinets and percussion is brilliant and raises once more questions about the 'cost-effectiveness' of full sized orchestras in 'grand' opera. Did 'associate composer' Julian Grant, who has a full-scale Odyssey on the stocks for Tête à Tête, help to pull the elements together? The singing/acting by the cast of six, led by Omar Ebrahim as Mr Fitzroy, aka the Count, is excellent throughout, as is Stuart Stratford's sharp and alert conducting and Bill Bankes-Jones's detailed direction, with every gesture telling. See Family Matters at The Bridewell before February 22 or catch it before March 30 on Tête à Tête's extensive tour. Family Matters should certainly be considered for capturing on video or DVD; it should not disappear, and would lend itself to revival in other productions.